We already told you in the previous article, that we wanna introduce you to the heart of our project. 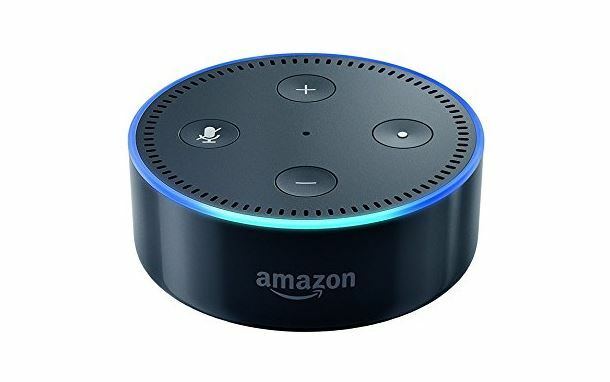 It’s Alexa BTW Alexa Echo Dot. But what can Alexa do for you? Well, in this review, we will tell you about the specs, the voice assistant behind, the dangers and the features of this product. We hope you enjoy it! Of course, first of all if you hear the words Smart Home – you’ll probably think at Smartphone, Tablets and Apps, which will do the work for you – isn’t? But it’s much easier than that. Nowadays it’s possible, to handle and do tasks with your voice. You don’t believe it? Well, go ahead in our article and we’ll show you how. In our article today, we gonna tell you a little bit about a little puck, but this on is special. He doesn’t only look good, he is also filled with a bunch oftechnicall highlights. But first of all, let’s get serious and check out the specs for the Echo Dot. The first step is always the hardest, and of course, you have to do it on your own, but don’t worry – it’s really easy and simple. 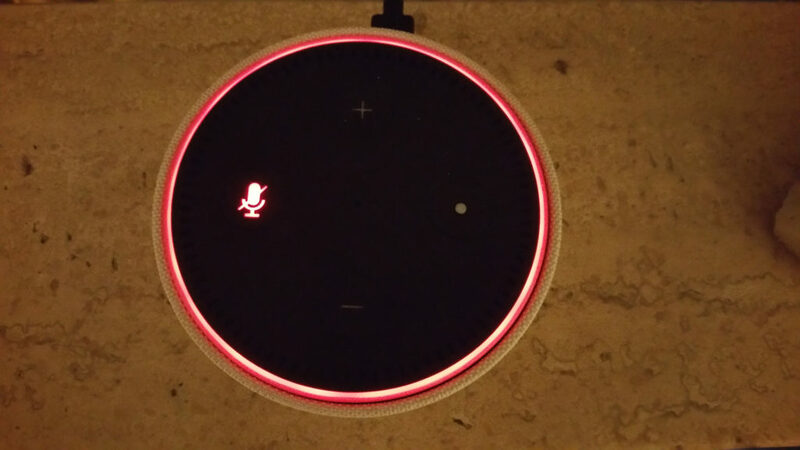 You only need an Echo Dot or a regular Echo. 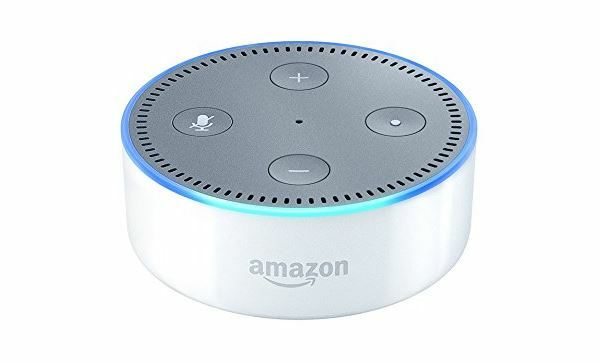 You can buy this item online or at your local Tech Shop (Currys, BestBuy, Walmart, Game etc) The Echo Dot costs around 59,99 Euro. As soon as you’ve bought the product and it lays down on your table, you can start with the process. Now you have to open the box and take out every piece in it. The box is very minimalistic. Let’s get serious. Our puck wants to talk to you – let’s get started. We recommend the charger which is included or a different USB Charger. 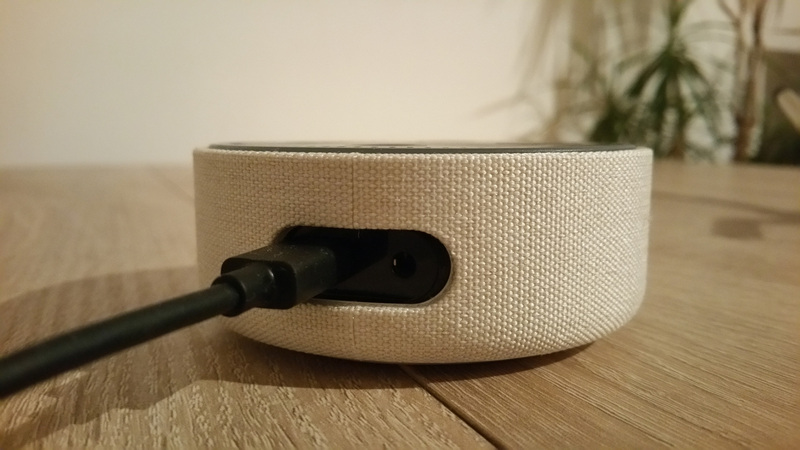 But remember, if you want to buy the Refurbished Echo Dot for 54,99 EUR, you must purchase the Cable and the charger separately. So at least you’ll pay more. It’s also important to know, that with our FritzBox 7390, we were unable to use the power from the USB 2.0 Plug to use the Dot on it. There is not enough power to use our device correctly. The Dot wasn’t able to initialize. Maybe it works with Devices which have a USB 3.0 port. That’s the reason why we suggest a regular charger. As soon as your Device is connected to the power grid, the LED ring will start to blink and looks like an old Disco Plate. After a few minutes, it’s done and Alexa welcomes you and asks for your Wi-Fi connection. Now you have to start the Alexa App (iOS and Android). Right now, there is no way to go through the setup with a regular Desktop PC or Laptop. Other manufacturers are a little bit smarter like Devolo. You can program your Devices on the webpage. Just as you’ve installed the app, you can start. 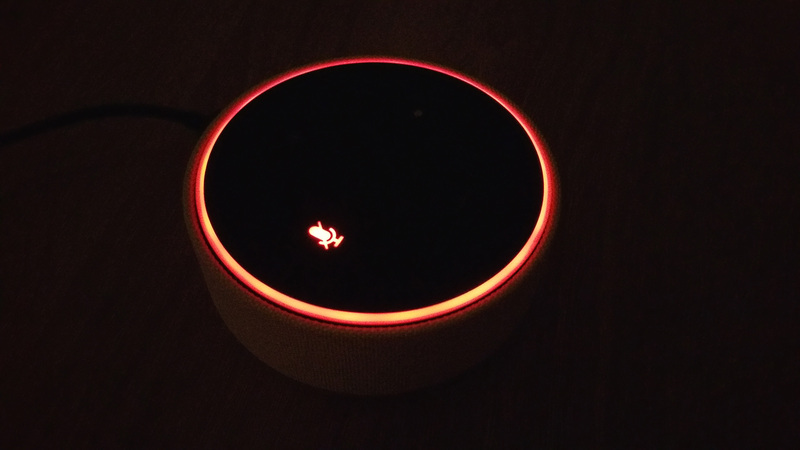 Alexa tells you that you should connect the Device to your App and your Wi-Fi. The description in the App is simple and you can follow the steps to link the Device to your Wi-Fi. 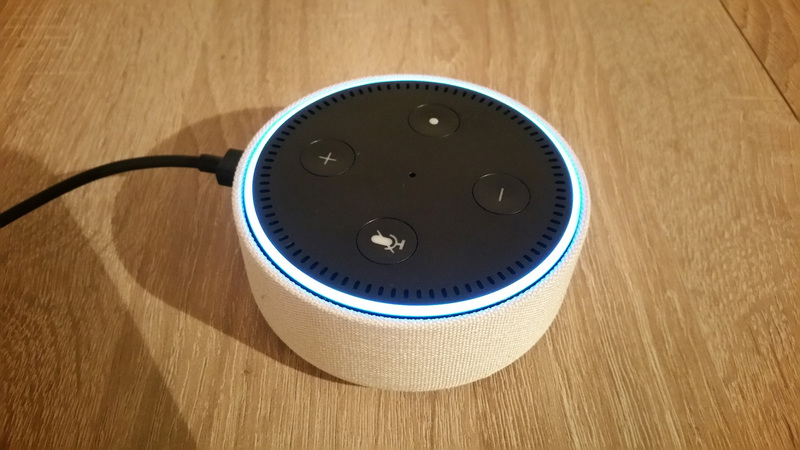 After you’ve logged in with your Wi-Fi password, the Echo Device takes between 5 to 10 minutes to initialize, updating and the sync. After these steps, you can now start to play with your Smart Home Assistant. Within this time, the LED ring flashes a little bit, don’t worry – that’s normal. After everything is installed, you can start to call your Flat Smart Home. The Dot is your Base and it’s now online. Now you can add Devices, Skills or connect more Dots. Right now, Echo Devices are able to take and make phone calls. But your partner also must have one of these devices otherwise, it’s not possible to have a conversation with him. There is also a Device which is Called Echo Show. With this little helper, you’re able to make video calls. Amazing isn’t? But this one is not cheap, it’s actually really expensive. It costs you right now 220 Euros. That’s one of the reasons, why we’ve chosen the Dot. Simple, useful and cheap. We want to invest the money in additional content, plugs and more. We also have the possibility with your Dot, to use Bluetooth as a way for connection for different Devices and plug in 3,5 jack Audio Devices. And yes, you have micro USB, the other ones have special connections and you need these cables. No need for additional cables. If you now want to talk to your Flat, you just have to use the “magical” word. Now the Device will awake and listens to you. Right now, there is a way to choose between 4 words: Alexa, Echo, Computer or Amazon. We are struggling with Computer and Alexa. But we would appreciate it, if we had the ability to use an own created word, like Technichub ;). But this option also must be coded because it should work. This would be amazing. Your magical word can be changed in the App. But how you can use this #puck now? Well that’s simple, just try these sentences. You always must use your magical word at the beginning in front of each sentence. (Alexa), what time is it? (Computer), how’s the weather or what’s the weather in Cardiff for example? (Echo), turn on the Stehlampe! (Amazon) what is 5 + 5? The Video Demo below is in german, because we’ve used the Video directly from our german Review. Don’t worry. You’ll see, it isn’t hard to use it, right? But don’t be disappointed if you can’t make a long conversation with Alexa, because this feature is not available at the moment. The KI won’t support that. It’s not Siri. The maximum amount of a conversation If you say to Alexa, turn on the light, she‘ll maybe ask you for which room or with lamp, but that’s it. The maximum of a conversation is between 2 and 3 sentences. We’ve made this experience with our #Xiaomi #Yeelight LED bulb. For that item, Alexa asks which lamp shall be changed, but normally the conversation goes is one way only. But you’re able to get better results if you use Skills. With skills, you have the ability to use more commands and get more features for your Dot. More and more Companies around the globe develop them. For example Xiaomi, Devolo, MeinFernbus (German Bus Transit), different Airports, BILD, ARD, Chefkoch and more. The Skills are different between the countries. In the UK you’ll have different skills as in Spain. You can book skills through your App or with your Desktop-Browser. But here is a little problem with third-party publishers. The voice control is very strict. For example – Alexa -open the Dictionary, Alexa – open the TV magazine, Alexa – start the vocabulary trainer. You have to use this scheme all the time, otherwise, it won’t work. You’re not able to start directly with Alexa, translate the word money into Spanish. You must start the skill first. We think that this should be patched immediately because it makes it smarter. But there are also skills, which are an exception. For Example the App Gäste Empfang, similar to the Service Desk. 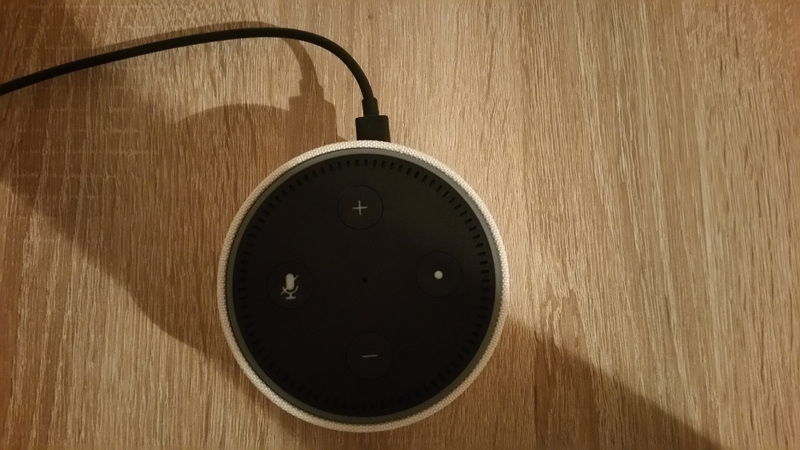 Of course, you have to start it with Alexa, open Gäste Empfang. Afterwards is the skill activated and it’s okay if you say: Alexa welcome Christian or if you haven’t said something a while – Alexa, say Hi to Christian. 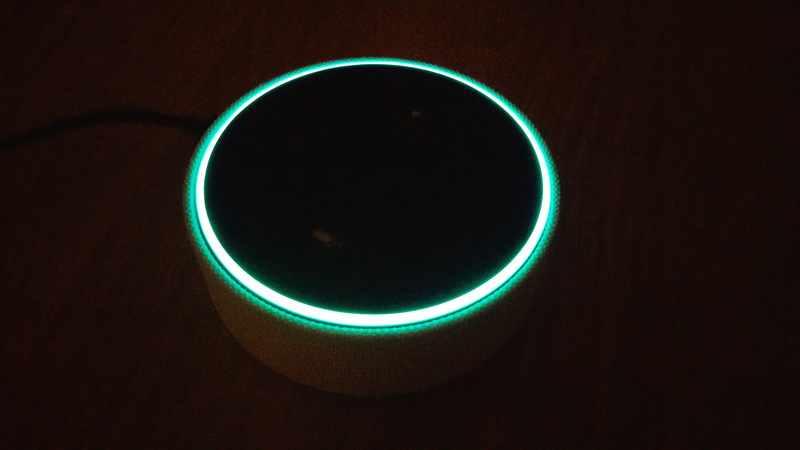 As soon as you’ve welcomed everyone, you should say Alexa Stop, otherwise, the App won’t stop and your Dot will talk to you the whole time. This skill, for example, is unable to stop without your command. 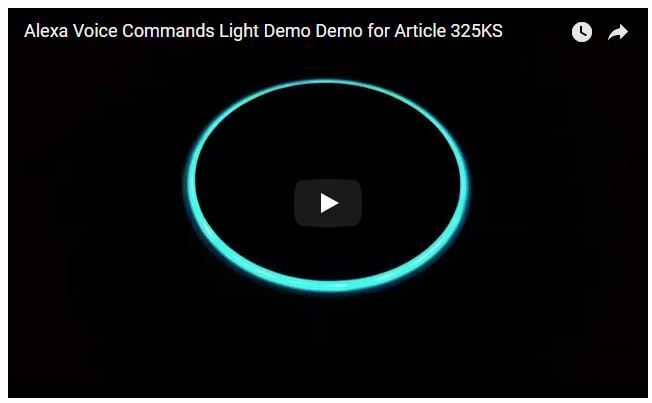 Wenn der Ring blau leuchtet, werkelt Alexa vor sich hin. But what can you additional do with Alexa? Well, the regular basis for example. This commands work perfectly and we think for 95% of the time. Set a timer, what time is it, create a shopping list, set calendar entries and more. That’s not a big issue. But the Device can still do more for you. It’s able to play your music. Fun fact, it works also with music you’ve uploaded to your Amazon Music library. But it works also very fine with prime music and your created Playlists. Of course, it also works with Music Unlimited. But also the competitors are available. Yes, we’re talking about Spotify – because that will also work, but only if you have a premium account. Free Account Users are not included. So, they can be happy because you don’t must listen to advertisements in their own flat. In the next few articles, we present you a few items which are compatible with Alexa, Google Home and more. Of course also Xiaomi Yeelight and other interesting stuff. So check out this Page a few times a week to get updates. We are pretty sure, that you are now a little bit worried about the Data privacy for this Dot and yes, we also do that. But what is then with Windows 10, iOS, Android, Windows Phone or Android in general? They all have assistants like Alexa and use a bunch of data to analyze something. The problem here is, no one can really say when Alexa listens to you or not. We’ve looked at our Upload list and yes, Alexa sends Data into the clouds but only then, if we give her some command. We know that she always listens because she must hear the magical word from you. Then she sends the sentence to the Amazon Cloud Servers and get back an answer and take action. In this case, we think, that the Device saves all the conversation but as soon as you give her a sentence, she’ll overwrite all the Data which she has collected before without the command. But yes, that’s still uncool because you’re still a little bit worried and terrified about, but that’s absolutely okay. You also can use the mute button or turn off the Device, if you have some important meetings or conversations. 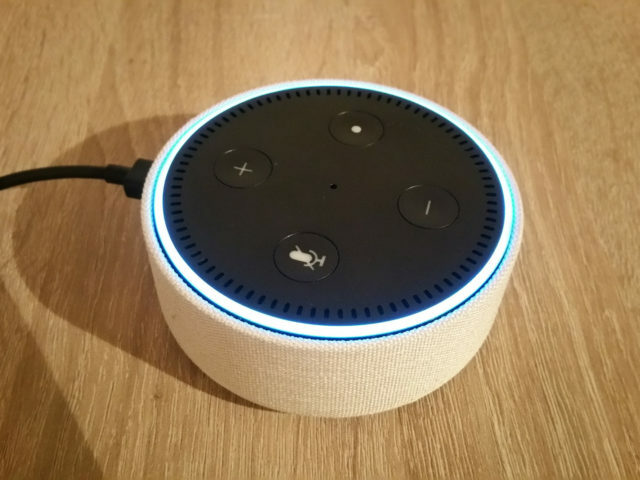 For example here in Germany, you should always tell your mates, Family and other persons, that you have this Device which listens to the conversation, Maybe they say that’s ok or if not, you should turn off the device, because it can become a legal issue when Alexa listens to this stuff and collects it in the Device, you can get sued for that. So tell all the people who are in your Flat or Office, that you have one of these things and it’s on. They’ll automatically tell you, whether it’s ok for them or not. Don’t be a jerk and ignore that. But what should you do now? What can you find out in our article? Do you need this Assistant or is it a more luxury product for more leisure? Well, it’s for both. You don’t need it in your Household but if you think a little bit about, what the Device can do for you at the moment and hopefully in the future, it’s nice to have. We are pretty sure, that this #technique will get a lot of new features in the next months or years. That’s part of the future, whether we want it or not. But one thing is guaranteed for the future, there will be a new product available, which has new or improved features. So if you want to be always modern and get all features, you’ll probably buy every or each second Generation a new Smart Home Hub Device like Alexa. We can give this product 7,5 out of 10 points. We really like the Idea behind and it’s really nice what you can do actually with the Device. It works well with our Devices and we were not disappointed. But we subtract a lot of points because of the Aspect of your and our Data. It’s a more than not transparent and Amazon insures themselves a lot of rights for collecting and analysing that data. Another advice for you. You’ll never should trust a company 100%, because it doesn’t matter how nice they are or how cheap the product is, a company always has to generate money. In this case also with your data. So, don’t look trough rose-coloured glasses, and think everything is fine. BE always a little bit pessimistic. One of the reasons why we’ve purchased the Dot from our money was, we wanted to talk directly to you without any limitation or different rules, what is allowed to say and what’s not. And yes, you can also use this Device as a puck or a modern door stopper if you want this product but not as a Smart Assistant. We hope you liked that article. We would be happy, if you come back to read our other articles or if you would like our Facebook page. Thanks for your attention.